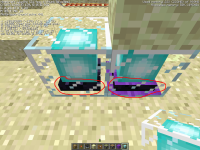 If you look at a beacon that is placed next to other blocks, the sides of the diamond block that are adjacent to other blocks disappear. Also placing a solid block above the beacon creates a texture bug at the obsidian part of the beacon. MC-8753 Beacon is not rendered good when is sorrounded by blocks. MC-9913 Beaocn core sides don't appear. MC-2616 Bug in Beacon textures. MC-3544 Beacon texture is glitchy!